Nûh ibn Lumik ibn Mutushalkh (Arabic: نوح‎, translit. 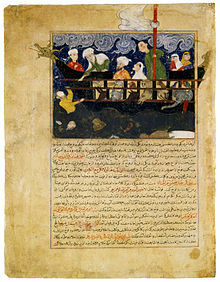 Nūḥ), known as Noah in the Old Testament, is recognized in Islam as a prophet and apostle of God (Arabic: الله‎ Allāh). He is an important figure in Islamic tradition, as he is one of the earliest prophets sent by God to mankind. [non-primary source needed] According to Islam, Noah's mission was to warn his people, who were plunged in depravity and sin. God charged Noah with the duty of preaching to his people, advising them to abandon idolatry and to worship only God and to live good and pure lives. Although he preached the Message of God with zeal, his people refused to mend their ways, leading to building the Ark and the Deluge, the Great Flood. In Islamic tradition, it is disputed whether the Great Flood was a global or a local one. Noah's preaching and prophet-hood spanned 950 years according to Quran. According to Islam, he was a prophet, sent to warn mankind of that region and his people to change their ways. He conveyed the message for over 950 years. Islamic literature recounts that in the Generations of Adam, many men and women continued to follow Adam's original teachings, worshiping God alone and remaining righteous. Among Adam's descendants there were many brave and pious men, greatly loved and revered by their respective communities. Exegesis goes on to narrate that, upon the death of these elders, people felt enormous grief and some felt prompted to make statues of these people in remembrance of them. Then, gradually, through the generations many forgot what such statues were for and began to worship them, (as the shaytan (satan) slowly deceived each generation) along with many other idols. In order to guide the people, God appointed Noah with the duty of being the next prophet to humanity. "O my people, worship Allah; you have no deity other than Him. Indeed, I fear for you the punishment of a tremendous Day!" An Islamic depiction of Noah in a 16th-century Mughal miniature. For Muslims, Noah was married to a woman whose name is not mentioned in the Quran. Some Islamic historians such as Al-Tabari have suggested that the name of Noah's wife was Umzrah bint Barakil but this cannot be confirmed. Most Muslims simply call her by her biblical name Naamah. [better source needed] Islamic scholars agree that Noah had four sons whose names were Ham, Shem, Yam and Japheth. According to the Quran, one of Noah's sons was a disbeliever who refused to come aboard the Ark, instead preferring to climb a mountain, where he drowned. It is agreed among most Islamic scholars that Yam was the one who drowned; the other three remained believers. In remembrance of Noah, Ashure, also called Noah's Pudding, a Turkish dessert, is made out of grains, fruits, dried fruits and nuts. These are believed to be the few ingredients left on the ark, used by Noah and his family to celebrate the end of the flood. ^ Hughes, Thomas Patrick (1995). Dictionary of Islam : being a cyclopaedia of the doctrines, rites, ceremonies, and customs, together with the technical and theological terms of the Muhammadan religion (Reprint ed.). New Delhi: Asian Educational Services. p. 435. ISBN 9788120606722. ^ Lalljee, compiled by Yousuf N. (1981). Know your Islam (3rd ed.). New York: Taknike Tarsile Quran. p. 73. ISBN 9780940368026. ^ What does the Qur'an say about the age of Prophet Nuh? Islam Stack Exchange. Retrieved 19 March 2017. ^ "The Wife of Prophet Nuh (as)". theislamicweb.blogspot.co.uk. ^ "Noah's Four Sons - TheTorah.com". ^ Kathir, Ibn. "Story of Nuh (Noah), The - SunnahOnline.com". sunnahonline.com.